To someone’s credit, Brooke left acting temporarily to study French Literature and graduated from Princeton University with honors. 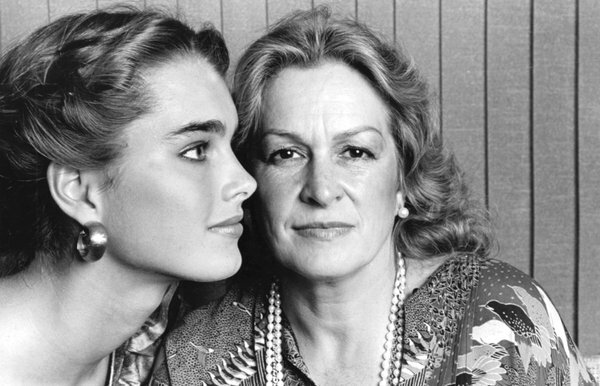 One of our original Hollywood Moms (aka momager) Teri Shields, mother of former Child Star Brooke Shields, died yesterday in Manhattan after a long dementia-related illness. She was 79 years old. Theresa Anna Lillian Schmon was born on August 11, 1933, in Newark, NJ. Prior to her career in entertainment, she worked as a hairstylist, a makeup artist and was herself briefly a model/actress. She married Francis Alexander Shields in 1964, and Brooke was born the next year. Francis and Teri divorced a short while later. Shields was often a lightning rod of controversy, greatly contributing to the stereotype of the aggressive “Stage Mom,” having allowed her child star to pose naked for photographers at age 10, and then work in sexually-charged roles in the films “Pretty Baby,” “The Blue Lagoon,” and “Endless Love.” Brooke also became the muse of Calvin Klein, and famously did the “Nothing comes between me and my Calvins” ad campaign in her mid teens. 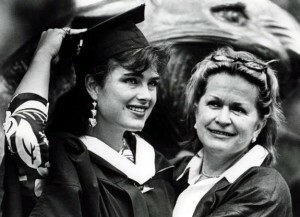 To someone’s credit, Brooke left acting temporarily to study French Literature and graduated from Princeton University with honors. 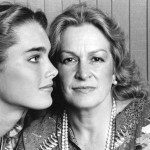 In 1995, Brooke and Teri parted ways professionally and their personal relationship suffered. When Teri was diagnosed with dementia in 2009, Brooke moved her mother into a nursing home and visited regularly. Born November 5, Kris Jenner celebrates her 57th! In more uplifting news, pop culture’s most famous Hollywood Mom, Kris Jenner, turned 57 on November 5. Jenner, a reality-television staple, is the mother/manager of reality stars Kim Kardashian, Kourtney Kardashian, Khloe Kardashian, Rob Kardashian, Kylie Jenner and Kendall Jenner and is married to former Olympian turned Hollywood Dad, Bruce Jenner. Also born on November 5 is Academy-Award winning former child star, Tatum O’Neal (daughter of Ryan O’Neal) who is now 49. According to TMZ, Modern Family Child Star Ariel Winter, 14, has been removed from the home she shares with parents Glenn and Crystal Workman following allegations of physical and emotional abuse by her mother in a guardianship hearing on October 3, 2012..
A second tabloid outlet is reporting that Ariel is seeking legal emancipation from her mom so she can be with her boyfriend. As a result of the hearing, a judge determined the allegations that Ariel was being physically and emotionally abused by her mother Crystal Workman were serious enough that the judge placed Ariel in a temporary guardianship with her older sister Shanelle Workman. Twenty years ago, Shanelle was herself removed from the family home by the Department of Children and Family Services based on similar allegations of abuse. Shanelle was subsequently in foster care for two plus years. She never returned to the family home. The judge has set another guardianship hearing for November 20, 2012.